The information for hikers on this website is not medical advice. Always consult your medical care providers. They can answer your questions and advise you about interactions between antioxidants and your medications or conditions. Maybe the whole topic of eating for strength on the trail is new to you. So let's start off with the obvious questions. Not to be a smarty pants or anything, but an antioxidant is a molecule that's anti oxidation. Which is a circuitous explanation that only a biochemist could love. Think of an antioxidant as a warrior molecule, built to protect your cells against exposure to high energy particles that may damage critical structures and functions. If you've heard of free radical, that's the high energy, unpredictable and unstable enemy. Going with the warrior analogy, they would be bullets piercing your cell membranes or damaging internal structures. An antioxidant can inhibit free radical formation during the process of oxidation. In other words, take away the bullets. And thus, delay or prevent cellular damage. And also protect your body against inflammation. Sounds like a full time job, right? I don't know about you, but when I'm pulling a long hill with a heavy-ish backpack, I go into open mouth breathing so I can gulp down oxygen molecules. These little atomic packages get delivered to my skeletal muscles, heart, and brain to keep me upright and mobile. But they also can generate those unhelpful high energy molecules known as the "I don't wanna play by the rules" gang. So let's agree that hikers need antioxidants because we all engage in vigorous, strenuous, continuous muscle contractions. Inevitably, this leads to free radical generation in our tissues. And sometimes, we keep ourselves in oxidative stress, day after day after day, on a hiking trek. Consider antioxidants as a cheap, effective cellular insurance policy. Fresh fruits and vegetables are sources of the best antioxidants for hikers. But you already know where this leads. Hikers cannot lug heavy acorn squashes, crates of richly colored but fragile berries or tomatoes, or bottles of red wine down the trail. 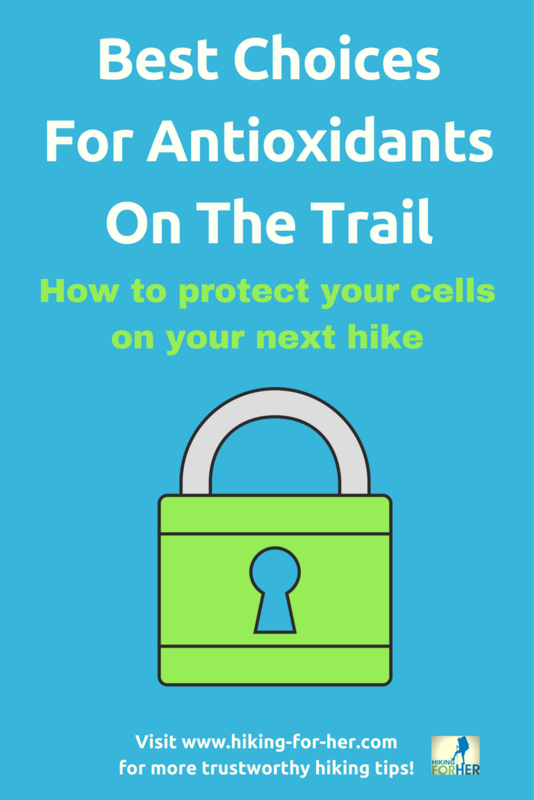 Vitamins A, C and E are pertinent to this discussion of best antioxidants for hikers. Eating foods containing them will help you recover from oxidative stresses. 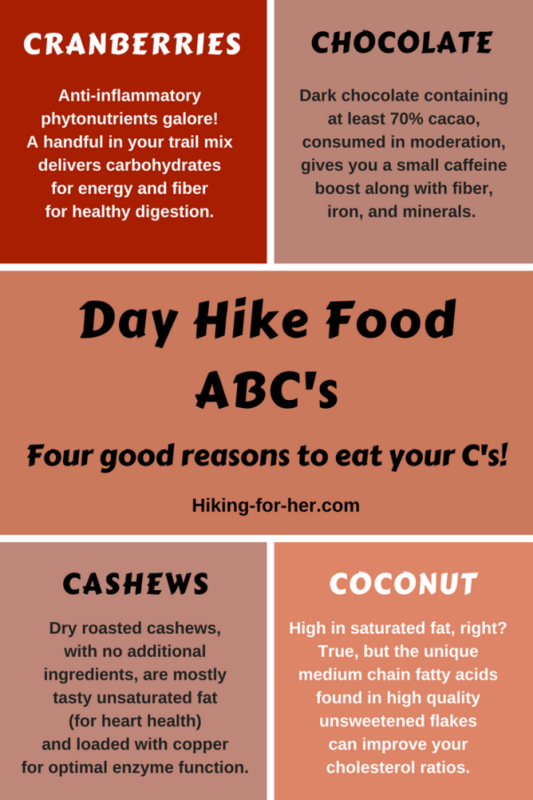 Tips on what to eat while hiking can be found below. These three vitamins are readily available in supplemental forms, and if you're going fast, light and hard over a number of days on the trail, please consider whether you should include them. These dietary supplements fact sheets can help you make that decision. For a thorough look at water soluble vitamin C sources for hikers, read this. NOTE: Vitamins A and E are fat soluble, meaning they can build up in your adipose stores if you're mega-dosing. Regular, small doses make sense on the trail. And there's more good vitamin news for hikers. This vitamin strengthens your vision, one of the first senses to be compromised at dusk and dawn on a trail. Which helps you differentiate between a tree stump and a bear! This is a powerful weapon against the day to day accumulation of inflammation in your hiking body. If you have Vitamin E capsules handy, pop them open (using clean hands) and rub the oil into insect bites, sun burns, or abrasions to soothe and aid healing. To dive deeply into choosing the best antioxidants for hikers (and any other human on the planet), read this. While we're on a roll, let's finish up with the last logical question on your mind. Space, weight, availability of water sources, and many other factors play into what you include or exclude in your hiking menus. Luckily, there are some really sneaky, inexpensive and genius level ways to sneak the best antioxidants for hikers into your food repertoire. If you're planning to rehydrate a grain or cereal for breakfast, tip over this package -like this- to fill up a small plastic bag. Toss a spoonful of this mighty tasty antioxidant blend on breakfast grains and desserts. The coconut provides a chewy, satisfying mouth feel. The high fiber will help you keep regular bowel habits on the trail. Be sure to drink a lot of water to get the full benefit of the fiber. Here are more reasons why hiking hydration should be a top priority for a hiker. Look forward to a handful of apple juice sweetened dried cranberries as a trail snack or oatmeal topping. Clinical trials with cranberries have established a connection with reduced severity of urinary tract infections (UTIs). Female hikers know that diminished hygiene on the trail can set us up for one of those nasty UTI episodes. Cranberry extracts are available in powder, capsule and tablet form, if space and weight are at a premium in your backpack. One of the best hiking foods is also one of the most portable, affordable, tasty choices for the best antioxidants for hikers: nuts and seeds. To make an antioxidant rich mouthful, choose almonds, hazelnuts, sunflower seeds, or peanuts. Read more about how to make the best Vitamin E rich choices for nuts and seeds here. As in beef, bison, turkey, venison, chicken and fish jerky. My favorite source of jerky comes from Tanka. EPIC also makes a clean, tasty source of these types of jerkies. Fish oil capsules are teeny tiny, nearly weightless, and chock full of vitamin A. Swallow 'em quick, to avoid a fishy taste. And store them in a crushproof package, not a plastic bag. You don't want mammals to realize that something's fishy in your backpack. Antioxidants are only one piece of your hiking nutrition puzzle. 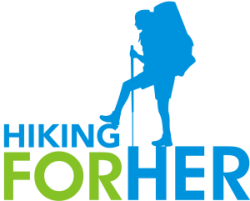 When you purchase through the links on this website, a small amount of money flows into the Hiking For Her coffers, allowing the best hiking tips to continue to flow freely. Everything recommended or reviewed on this site is trail tested and considered worthy of your time and attention. And no free radicals are formed.